Built to your budget and to our high standards. At H4 we specialize in design and construction of custom homes and major renovations. We work closely with our clients to provide well designed, affordable, and crafted living spaces. Concentrating on design and build quality “V” quantity, using the most advanced materials and building technology, including PassivHaus we are quietly creating and improving peoples lives one project at the time. and “Nature” will thank you. How to avoid home building budget blowouts. Why you shouldn’t fall in love with an “off the shelf” floor plan. Healthy Home = Healthy Family – protect the people you love. Why PassivHaus – the fastest growing building performance standard in the world. Yours Free to keep and please share. Sometimes it is hard to know where to start, whether you are contemplating building a new home or a major renovation. 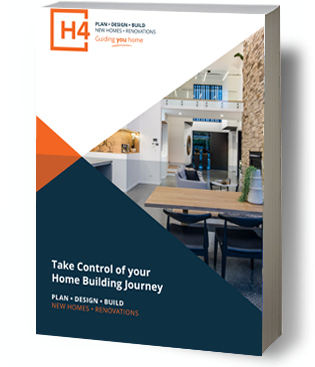 You’ll find the H4 processes are as thoughtfully designed as the homes we build. You’ll still be experiencing the benefits in years to come as you enjoy the experience of designing your own home with us, just the way you’ve imagined, and perhaps more affordable than you think. Design – Mindful cost-effective residential design and coordinated interiors. Healthier – We are experts in healthy Homes /protect your family. Efficiency – Future proofed against energy price rises. Comfort – Exceptional levels of thermal comfort summer/winter. Quality – Exceeding national building code standards on every project. Award winning home designers + Builders in Sydney, Brisbane, Gold Coast, Sunshine Coast: small lot home designs, sloping site home designs, acreage home design, energy efficient home designs, knockdown and rebuild, Hampton style homes , corner block house designs, split level home designs, three level home designs, contemporary house plans, open living home designs.